Paulist Fr. Charlie Donahue is an associate director of St. Thomas More Newman Center, home of the Catholic campus ministry at The Ohio State University in Columbus, OH. Fr. Charlie joined our novitiate in 1999, made his first promises to our community on August 5, 2000, and was ordained a priest on May 21, 2005. 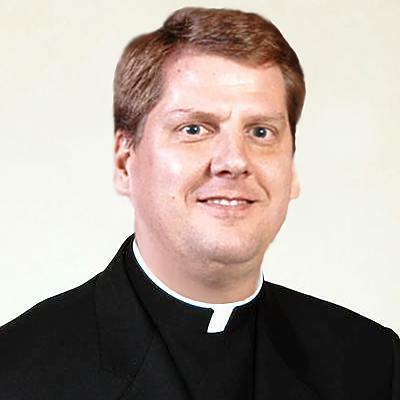 He served from 2014 to 2016 as our seminary's director of formation and as superior of the Paulist Fathers in Washington, D.C.
From 2009 to 2014, he was pastor of St. John XXIII University Parish, the Catholic campus ministry we serve at the University of Tennessee in Knoxville, TN. During his time in Knoxville, he also was a police chaplain. From 2005 to 2009, he was associate director of Newman Hall - Holy Spirit Parish at the University of California at Berkeley. In his free time, Fr. Charlie enjoys hiking, cooking and reading. In an interview about his vocation, he said he loves the great Augustinian phrase "Our hearts are restless until they rest in God." "The simple contentment that comes from living in way that is in concert with the will of God is very consoling and quite wonderful," he said. "And, being a Paulist is a beautiful thing and I wouldn't have it any other way." For photos of Fr. Charlie, please visit Pinterest.